● I look good when I wear helmet. ● Helmet is the way to prevent accidents. ● Wear helmet, ride safely. ● Everything looks better from inside of helmet. ● Wear helmet because someone is waiting for you at home. ● We should wear helmet, we are not as lucky as lord Ganesh. ● Rule the road but first wear the crown. ● Life is tough so wear helmet. ● A single helmet can save your 100% brain. ● Helmet gives you extra courage to win the race. ● Helmet projects you from mis-happening. 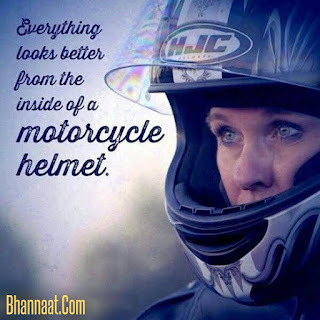 ● Helmet gives you more long lasting happiness. ● Helmet saves you from upcoming sadness. ● Helmet saved you from both police and sudden death. ● Helmet saves you from all season. ● Wear helmet for you and your family. ● Helmet is like a polio vaccine, you have to take it first. 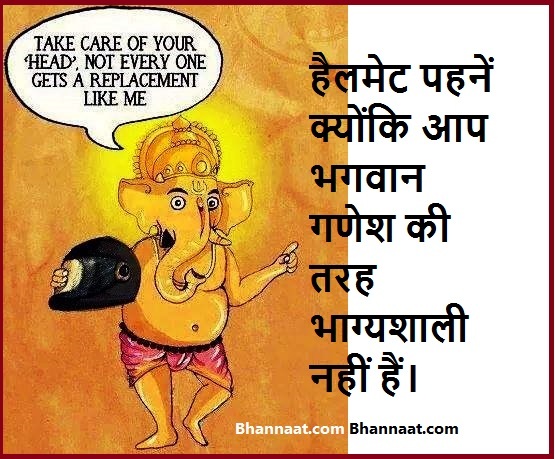 ● Helmet is a weapon to fight Yamraj. ● To know the benefits of helmet, watch 2 wheeler accident video. ● When you wear helmet your eyes speak. ● When I'm wearing a motorcycle helmet, people don't know who am I. So I just wander around and, yeah, it's pretty awesome. ● When i wear helmet i look like a warrior.